The Elder Scrolls Online will supplement its monthly subscription fees with microtransactions for "fun stuff and services." Bethesda announced a couple days ago that The Elder Scrolls Online, in defiance of conventional wisdom, will require a monthly subscription fee when it launches. But in an interview with German site ESOHub, director Matt Firor said it will offer microtransactions as well - but only for non-essential stuff. "We'll have a shop to buy kind of fun stuff, and services too, like name changes and things like that. But it's not part of the core game," he said. "Anything in the core game is included in the subscription price." Firor repeated his earlier explanation for opting for a subscription model over free-to-play, saying that internal monetization would disrupt the experience of being in The Elder Scrolls "sandbox," something Bethesda is determined to avoid. "It's an Elder Scrolls game. It feels like an Elder Scrolls game - minimal interface, mouse and keyboard are just like they were in Oblivion and Skyrim," he said. "That's what the whole purpose is, you want to be the next Elder Scrolls game." The article is in German but the interview itself is conducted in English, so you don't have to worry about wonky Google translations. 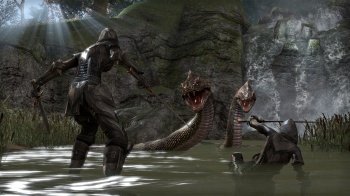 The Elder Scrolls Online is slated to come out in the first quarter of 2014 for the PC, Xbox One and PlayStation 4.